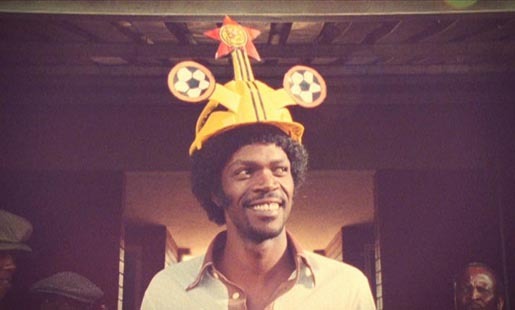 Heineken, the Dutch brewing company, made the connection between South African FIFA World Cup culture and the passions of the Netherlands in “Pletterpet”, a television commercial featuring the Makarapa, a hand-cut and hand painted hard hat worn by sports fans. We open on a shot of soccer supporters in the stands at a local South African soccer match in the 1970s. An overzealous supporter loses his grip on his Heineken and we see the bottle bouncing on the heads of unsuspecting supporters, including that of our main character Alfred Baloyi. Following on from this experience, Baloyi goes on to develop the “Makarapa”, a uniquely South African decorative soccer hat made out of a regular protective hard-hat. Finally we see an older Baloyi in present day South Africa at a World Cup Soccer game where the South African supporters are all wearing Makarapas. As Baloyi claims the Makarapa is exclusive only to South Africa he is interrupted by a Dutch supporter wearing a bright orange Makarapa. We cut to a shot of the Dutch supporters who are all wearing Makarapas decorated in the traditional Dutch colours. The Pletterpet campaign was developed at TBWA Neboko, Amsterdam, by creative directors Jeroen van de Sande & Jorn Kruijsen and agency producer Marije Braber. Filming was shot by director Greg Gray via Velocity Films, Cape Town, with executive producers Peter Carr and Nicola Valentine, producer Helena Woodfine, director of photography Paul Gilpin. Post production was done at Black Ginger, Cape Town and The Ambassadors, Amsterdam. Editor was Ricky Boyd at Deliverance Post. Music is “Sweet Malady”, from Fat Mama Publishing, Mama Dance Music Library.